Last March we stayed at the Venetian in Las Vegas and enjoyed two amazing brunches at Bouchon. One morning, Jeremy ordered the Chicken and Waffles, described on the menu as “roasted chicken, bacon and chive waffle, Tahitian vanilla bean butter, sauce chasseur.” We couldn’t stop talking about it, and after a Google search, I see we’re not alone. Today I made us Bouchon-inspired chicken and waffles for brunch. 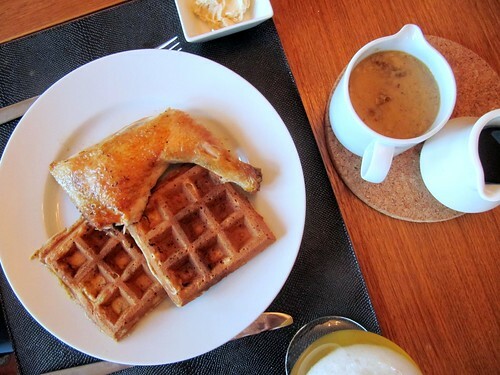 This Chicken and Waffles recipe from The Cookworks was a good basis, but I made a few changes. For the waffles, I added minced chives and three slices of finely diced crispy bacon to the batter (also, I substituted milk with a squeeze of lemon juice for the buttermilk, simply because I didn’t have any). Instead of skin-on chicken breast, I used moderately sized leg quarters. Last, I omitted the dijon cream sauce and instead emulated Bouchon’s menu with vanilla butter and something like a sauce Chausseur (I didn’t go crazy with ingredients here – I essentially made a gravy from rich chicken stock with some shallots and wine). I’d rather eat the Bouchon version, but when I’m over 2000 miles away, this is a pretty good brunch. Next time I make it, I’ll omit the sugar in the waffle recipe. The Bouchon version uses sourdough, so maybe I’ll try a yeast dough as a base…well, before “next time” we have to eat our way through the 10 leftover waffles in the freezer. Not that I’m complaining. Never had the Bouchon chicken and waffles…. But Keller’s fried chicken recipe from Ad Hoc at Home is da bomb. I’m addicted to his fried chicken like it was heroin. Please let me know the next time that you are in Las Vegas and i will bring you in the kitchen to make chicken and waffles! I will definitely take you up on that offer someday!